Warning: If you are one who thinks life and ministry is all work and no play, please do NOT read the following post! You have been warned. 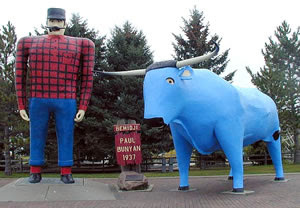 God gave us a great weekend of ministry, fun, and food last weekend in Bemidji, MN, the land of Paul Bunyon and Babe the Big Blue Ox. I spoke at Oak Hills Christian College and did Ministry Is Relationships training with youth workers (volunteer, vocational, and those training to be vocational) as a part of MCMA's The Northern Minnesota Church Ministries Institute. This northern Minnesota ministry adventure began when I boarded a plane in Peoria, IL, for the Minneapolis/St. Paul International Airport last Thursday morning. Tim Johnson, Executive Director of the Minnesota Church Ministries Association (MCMA), found me wandering aimlessly in the airport. We jumped into the van and picked up Steve O'Dell, pastor of the New Prague Alliance Church in MN. Then we began our four hour journey north toward the frozen tundra. After a couple of hours of driving, we pulled off the interstate to eat in Little Falls, MN. 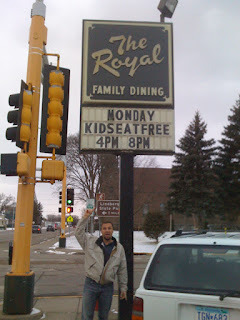 We found a local diner, The Royal, and walked in to see what was cooking. After driving another hour or so, we arrived in Motley, MN, where we continued to harass Tim by celebrating his 54th birthday at the local Dairy Queen. (We thought some ice cream would sit nicely on top of the massive amounts of liver and onions and sauerkraut soup mixing up in our stomachs.) We got the entire place (six people including us) to sing happy birthday to Tim. I actually heard three-part harmony! And the gal working the counter came up with a candle for us. Happy birthday... dad! Now, I know what some of you are thinking. "Hey, did you actually do any ministry in MN?" In addition to eating abundant amounts of liver, onions, sauerkraut soup, and ice cream (this is day one mind you), our mission was also to spread God's cheer and good will to the hamlets of MN on the way. We did, however, eventually arrive at Oak Hills Christian College in Bemidji, MN. It was late and we were exhausted—and thankful to not be sick from the liver, onions, sauerkraut soup, and ice cream. The next morning, I was to speak to the students in the college's chapel service. But first, we had to have some breakfast (can't do ministry at the level of intensity we like to without a hearty breakfast) and a time of connection with my good friend, Dwight Warden, Senior Pastor of the Evangelical Free Church in Blackduck, MN (a mere 20 miles away from Bemidji). Tim (left), Bill (center), and Dwight Warden (right) enjoying some bacon, eggs, pancakes and coffee at Southside Restaurant. Indeed, I did speak at the chapel service on Friday morning. We then ate lunch with them (I had a salad with chicken and three glasses of very cold chocolate milk) and hung out with them until mid-afternoon. The students were kind to us old guys and engaged us in some great conversations. Most of the youth ministry majors also attended the Ministry Is Relationships training I did the next day at the Northern Minnesota Church Ministries Institute... and we had a blast interacting with God and each other... having our hearts encouraged and our hands equipped... leaving our time together in MN last weekend having experienced God... more in love with God... and we believe... more effective in serving God. Ministry—like life itself—is NOT just a destination. It's also a wild adventurous journey... laden with God, friends, community, debate, liver, onions, sauerkraut soup, ice cream, bacon, eggs, pancakes, salad, chicken, chocolate milk, and—in my view—second only to God in the preceding list—good coffee. Looks like we have a location for our next PALC lunch. Ahhhh the Motley DQ - home of the Motley Monster. Your post warms the deep dark memories and wandering grounds of my time in the homelands.